After filling in one of my major cultural blindspots by finally reading Hamlet, I have decided to start a recurring series on the blog in which I watch and discuss different cinematic interpretations of arguably Shakespeare's greatest, most fascinating play. To kick things off, I have decided to watch the 1948 version, starring and directed by Laurence Olivier. Hamlet, both the play and the character, looms so large over Western culture that it's amazing to think that anyone would dare to take it on. Fascinating and infuriating in equal measure, Hamlet is a character who can be interpreted differently by pretty much any actor, and as such is a daunting role for anyone to undertake: there can be no definitive take on Hamlet because his nature is so fractured and ambiguous that he can be whatever the actor and audience want him to be. It's for that same reason that every generation gets its own Hamlet, whether he is played by Laurence Olivier, Kenneth Branagh or Mel Gibson, and why the character remains so vital and relevant no matter how many times he is revisited: you can take Hamlet and place him in any context but his essence will always shine through. 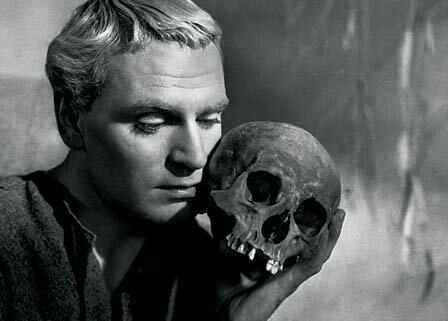 In 1948, Laurence Olivier directed and starred in the first English-language film version of Hamlet ever produced. (Though the play had been brought to the screen in a number of silent versions, and there was one sound film that pre-dated Olivier's: an Indian version produced in Urdu some years before.) Having already brought one Shakespeare play to the big screen in the form of Henry V, for which he was given an Honorary Oscar, Olivier turned his attention to The Dane, and was duly rewarded for his efforts with an Oscar for Best Actor, whilst the film itself won Best Picture despite being up against The Red Shoes and The Treasure of The Sierra Madre. Considering its importance within the canon of Shakespeare on film, does Olivier's Hamlet still hold up as a rendition of a classic work, or has time rendered it a period piece in more than just its setting? The first thing that surprised me about Olivier's film is just how genuinely cinematic it is, at least in comparison to what I was expecting going in. I'm loathe to trust sweeping generalisations in film criticism because I find them horrible reductive and stultifying, but one of the few that I tend to subscribe to is that great actors make for pretty poor directors. There are obvious exceptions to this rule: one of the greatest films ever made, The Night of the Hunter, was directed by Charles Laughton, a phenomenal actor who had never directed before and never would again, and recent films like Paddy Considine's Tyrannosaur and Ralph Fiennes' Coriolanus demonstrated that just because someone is best known for being in front of the camera doesn't mean that they can't be a wiz behind it. However, most of the time when an actor decides to direct, their work tends to be visually flat, favouring performance over other considerations. Whilst Olivier's film is very focused on its performances - how could an adaptation of a Shakespeare play not be? - it also displays some incredibly striking visuals and set design that really take the play out of the realm of theatre and into that of cinema. The castle of Claudius (Basil Sidney) does not resemble a castle so much as a colossal labyrinth, and from its opening shots, Hamlet establishes that this place is not necessarily real, but a metaphorical representation of Hamlet's mind. The use of deep shadows and stark black and white photography, as well as an oppressive, ever-present fog, recalls the murky, rain-soaked streets of many a film noir, and the high-ceilinged rooms and endless, winding staircases owe a clear debt to German Expressionism. Olivier does not merely mirror the works of his contemporaries, but also seems to point towards the future as well. His camera glides around the castle like a restless spectre, and his astonishing tracking shots display a craft and sophistication that predicts the great work that Stanley Kubrick would do on Paths of Glory. It's a film that feels like a film, rather than just a filmed play. The other aspect of the film that surprised me was the sensuality of it, and the way that Olivier chose to play up the Oedipal aspects of the play by casting Eileen Herlie as Gertrude, Hamlet's mother, despite her being 13 years younger than Olivier. There's an unnerving frisson between Hamlet and Gertrude that adds a real edge to the story, and casts Hamlet's reaction to Claudius marrying his mother in a very different light. It would be considered pretty brave for a version of Hamlet made now to take this overtly sexual approach to the mother-son relationship, so for Olivier to take that approach in 1948 must have been nothing short of shocking. And what of Hamlet himself? What does Olivier bring to one of most frustrating and compelling figures in all of Western literature? Whilst his performance does capture many of the different facets of the character - his sadness, his cruelty, his moments of fancy - and he delivers the key moments with aplomb (his rendition of the "To Be or Not To Be" soliloquy is pretty hard to beat), his take on the character winds up being a touch dull. He approaches Hamlet from a largely heroic viewpoint, and his decision to excise the political subtext of the play - there is no mention of the fact that Hamlet's father had brought the country to the brink of war with a neighbouring nation or that Claudius is trying to broker peace - takes away a lot of the ambiguity from Claudius' character. He is no longer a man who committed a terrible act for potentially good reasons, but one who committed it for reasons of pride and greed. In that context, Hamlet can only be a hero, even though he is also spiteful and destructive. It's not an approach to the character that is without merit, but it is a touch too easy, and seems to work against the darkness - both literal and figurative - of the film itself. Despite the rather cut-and-dried approach to Hamlet himself, and a few moments of technical awkwardness brought on by the limitations of technology at the time, Olivier's Hamlet is a marvellous realisation of the play. The atmosphere and mood of the piece are sublime, perfectly capturing the anxious mood of its hero and expressing his psychology through the physical world, rather than relying solely on performance. Even more than six decades later, it remains a vibrant and exciting work befitting both its source and its director, who displays his singular understanding of Shakespeare's work by taking it out of the theatre and on to the screen in glorious fashion.